Character and opportunity go hand in hand. Character strengths are often needed in order to take the opportunities that come our way, including the prudence to value the future over the present and the drive or ‘stick-with-it-ness’ to complete onerous but important tasks. Education, work, and relationships all demand these strengths. But opportunities also provide the necessary incentives to develop these strengths, in the knowledge that rewards will follow. Heckman’s comment comes in his contribution to our new essay collection, with pieces from a distinguished panel of contributors: Martin Seligman, Carmit Segal, Amitai Etzioni, Isabel Sawhill, Larry Mead, Jen Lexmond, Marvin Berkowitz, Mike Rose, Stuart Butler, Joseph Fishkin, Ross Thompson, Brent Roberts, Marc Dunkelman, Lanae Erickson Hatalsky, Dominic Randolph, and David Brooks. There’s plenty of disagreement here, but plenty of wisdom, too. 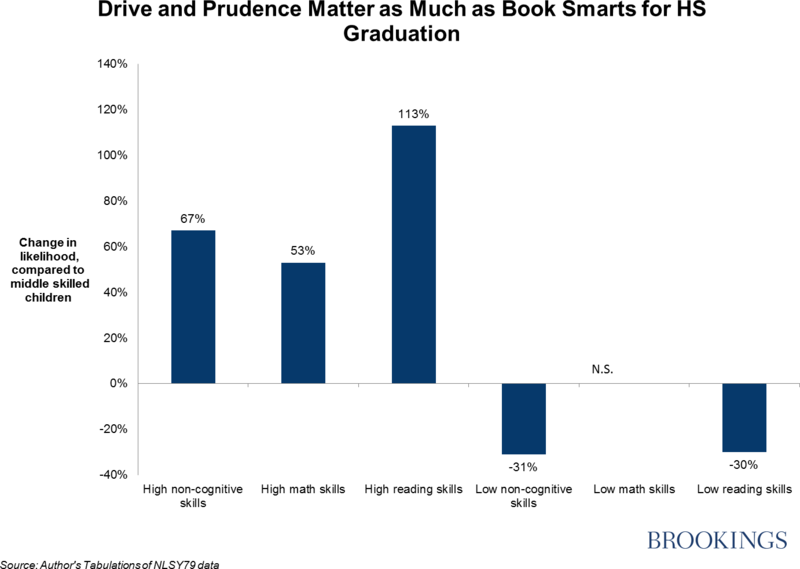 On the basis of our analysis, then, the relationship between character strength and high school graduation is in the same ballpark as cognitive skills – in both the positive and negative direction. Compared to the field of cognitive skill measurement, the character strengths movement is still in the foothills, both in terms of evidence and policy. As we learn more about the importance of character strengths and disparities in their development, the need to move forward – if only through more research and evaluations of existing character-development programs – becomes more urgent, not least in terms of boosting social mobility. I have written at greater length on the political implications of a focus on character in my own essay “The New Politics of Character” (originally published in National Affairs, Summer 2014). There is a long way to go, empirically and philosophically. But it is clear that for greater mobility, we need not only to increase opportunities, but also to ensure that people are able to seize them.